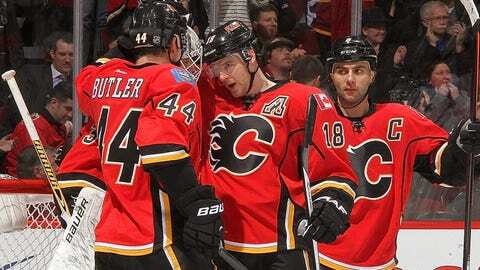 The Flames celebrate with Matt Stajan after his go-ahead goal vs. the Coyotes. Sean Monahan got the Calgary Flames off to good start and they finally ended weeks of frustration at home. Monahan scored his team-leading 14th goal of the season and Matt Stajan got the game-winner as the Flames beat the Phoenix Coyotes 3-2 Wednesday night to snap their team-record seven-game home losing streak. Monahan opened the scoring at 11:44 of the first period, marking the first time in nine home games Calgary scored first. The Flames hadn’t held a lead in a home game since Dec. 12, the day former general manager Jay Feaster was fired. Lance Bouma also scored for Calgary, which scored more than two goals for the second time in 14 games since Christmas and had been outscored 22-4 during its home skid. Karri Ramo finished with 30 saves for the Flames. Antoine Vermette and Shane Doan scored for Phoenix, which has lost eight of its last 11. The Coyotes remained four points behind Minnesota for the second wild card spot in the Western Conference. Stajan’s score with just under 4 minutes remaining in the second put the Flames up 3-1. Stajan, fresh off signing a four-year contract extension two days ago, slapped a 40-footer past Phoenix goalie Mike Smith. Phoenix got back to within one when Doan snapped a shot past Ramo at 6:50 of the third period. Despite a couple dangerous chances in the waning seconds after pulling Smith for an extra attacker, the Coyotes could not tie it. Monahan’s goal was set up by TJ Galiardi’s hustle. After winning a race to the puck deep in the Coyotes’ zone, Galiardi promptly zipped the puck in front where Monahan tapped it in behind Smith. Monahan, the sixth overall pick from last June’s NHL draft, is third in rookie goals behind Colorado’s Nathan MacKinnon (17) and San Jose’s Tomas Hertl (15). Ramo was especially sharp in the opening 20 minutes when Phoenix outshot the Flames 11-6 but trailed 1-0. Bouma made it 2-0 at 8:48 of the second period on a perfectly executed fast break. Curling out from behind his own net, TJ Brodie threaded a long pass to Bouma at the Phoenix blue-line. In behind the Coyotes’ defense, Bouma darted in and snapped a perfect shot into the top corner. Vermette cut the lead to 2-1 on a short-handed goal less than 5 minutes later, beating Ramo on a one-timer just inside the goal post. Smith finished with 23 saves. NOTES: Flames LW Mike Cammalleri (concussion) missed his sixth game. Also out for Calgary was LW Paul Byron (foot). … Missing for Phoenix was C Martin Hanzal (lower body), who missed his second game and D David Schlemko (upper body). Both are day-to-day. … Calgary’s only two regulation wins in the last 21 home games have come against the Coyotes. They also beat Phoenix 4-1 on Dec. 4. … After 48 games without one, the Coyotes scored a short-handed goal for the second consecutive game.